Although the New Era Tissue Salts are back for sale in the UK as from June 2015 (see them here – http://www.elixirhealth.co.uk/New-Era-Tissue-Salts.asp), many people have discovered the Schuessler Tissue Salts and are perfectly happy to continue using them as an alternative to New Era ones. The Schuessler tissue or cell salts are actually the original homeopathic salts whose origins can be traced back to the turn of the century when the natural physician, Heinrich Reckeweg (1877-1944) founded ‘Laboratorium EUPHA’, and started to produce them. So as not to confuse, all tissue salts are therefore Schuessler Salts, but each may carry different ‘brand names.’ New Era is a brand name that supplies ‘Schuessler Salts’ just like there are other ones as well, made or manufactured by different companies. The original salts came from Germany and were manufactured by Dr Reckeweg and these are the only ones simply called Schuessler Tissue Salts, like the ones we displayed on the page. 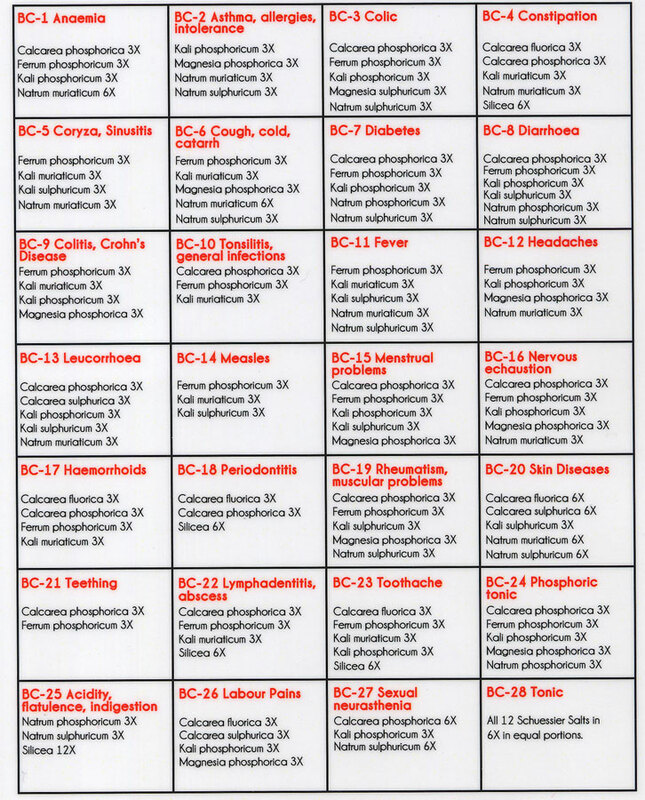 The bottles of the Individual Schuessler Tissue Salts are labelled with the same names of all the 12 salts and have the same numbering classification as the equivalent New Era Individual Salts. Calc Flour – No.1 : Calcium Flouride for tissue elasticity; impaired circulation; varicose veins; piles. Calc. Phos – No.2: Calcium Phosphate -Debility; repaired digestion; teething trouble; chilblains. Calc. Sulph – No.3: Calcium Sulphate – Acne, adolescent pimples; skin slow to heal; sore lips. A blood constituent. Ferr. Phos – No.4: Iron Phosphate – Blood stream oxygenation; chills; fevers; inflammation; congestion coughs; colds. Kali. Mur– No.5: Potassium Chloride – Minor respiratory ailments; coughs; colds; children’s feverish ailments. Kali. Phos– No.6: Potassium Phosphate – Nerve soothing, exhaustion, indigestion, headache; stress due to worry or exhaustion. Kali. Sulph– No.7: Potassium Sulphate – Skin condition; skin eruptions with scaling or sticky exudations; falling hair; diseased nails; catarrh. Mag. Phos– No.8: Magnesium Phosphate – Cramp; neuralgia; flatulence; spasmodic nerve pains. A soft tissue constituent. Nat. Mur – No.9: Sodium Chloride – Maintaining body water distribution; watery colds, flow of tears; loss of smell. Nat. Phos– No.10: Sodium Phosphate – Over acidity of the blood; gastric disorders; heartburn; rheumatic tendency. Nat. Sulph– No.11: Sodium Sulphate – Water infiltrations; liverish symptoms; influenza; bilious attacks. Silica– No.12: Silicon Dioxide – Impure blood & for boils, brittle nails & lack-lustre hair. **Breaking News** NEW ERA COMBINATION H for HAY FEVER. NB: If you want to order the equivalent New Era Combination H, which was formerly used for hay fever, choose the Scheussler Tissue Salt BC-2. The ingredients are not an exact homeopathic match but this is the equivalent Scheussler salt sold in many parts of Europe and the rest of the world for the same symptoms. While the Schuessler ‘Individual or Single Salts’ contain exactly the same ingredients as the New Era tissue salts. However, not all the ingredients in the ‘Dr Schuessler Combination Salts’ match exactly with New Era but there is a good deal of overlap, making it possible to suggest an equivalent in the Schuessler range. The Schuessler Combination salts are generally indicated for the same use and purposes. However the Schuessler Combination Salts number more in their range than the New Era (28 as opposed to 18) and so cover a broader spectrum: As is the case with homeopathic treatment some salts can be substituted for each other in the treatment of the same condition. Users say they tend to receive the same results moving between New Era’s own salts and Dr Schuessler’s but the only way is to try them and see for yourself. As a general precaution to safeguard your health especially where symptoms are of a serious nature, such as in the case of asthma or diabetes, we recommend consulting a physician or professional homeopathic doctor instead of self-caring. If there is any doubt, at any time, as to the state of your health refer the matter to your doctor or health care practitioner. Schuessler Combination Salt BC-1: Anaemia: Ingredients: Calc phos 3X, Ferr phos 3X, Kali phos 3X, Nat mur 3X. Schuessler Combination Salt BC-2: Asthma, Allergies, Intolerance: Ingredients: Kali phos 3X, Mag phos 3X, Nat mur 3X, Nat sulph 3X. Schuessler Combination Salt BC-3: Colic: Ingredients: Calc phos 3X, Ferr phos 3X, Kali phos 3X, Mag phos 3X, Nat sulph 3X. Schuessler Combination Salt BC-4: Constipation: Ingredients: Calc fluor 3X, Calc phos 3X, Kali mur 3X, Nat mur 3X, Silicea 6X. Schuessler Combination Salt BC-5: Coryza, Sinusitis: Ingredients: Ferrum Phos 3X, Kali mur 3X, Kali sulph 3X, Nat mur 3X. Schuessler Combination Salt BC-7: Diabetes: Ingredients: Calc phos 3X, Ferr phos 3X, Kali phos 3X, Nat phos 3X, Nat Sulph 3X. Schuessler Combination Salt BC-8: Diarrhoea: Ingredients: Calc phos 3X, Ferr phos 3X, Kali phos 3X, Kali sulph 3X, Nat phos 3X, Nat sulph 3X. Schuessler Combination Salt BC-9: Colitis, Crohn’s Disease: Ingredients: Ferr phos 3X, Kali mur 3X, Kali phos 3X, Mag phos 3X. Schuessler Combination Salt BC-10: Tonsillitis, general infections: Ingredients: Calc phos 3X, Ferr phos 3X, Kali mur 3X. 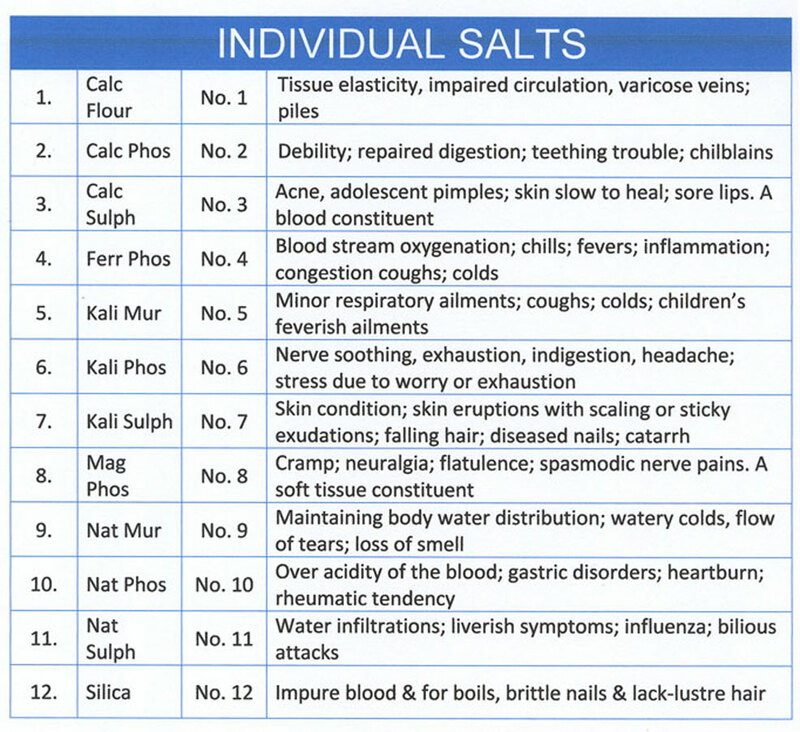 Schuessler Combination Salt BC-12: Headaches: Ingredients: Ferr phos 3X, Kali phos 3X, Mag phos 3X, Nat mur 3X. Schuessler Combination Salt BC-13: Leukorrhoea: Ingredients: Calc phos 3X, Calc sulph 3X, Kali phos 3X, Nat mur 3X. Schuessler Combination Salt BC-16: Nervous Exhaustion: Ingredients: Calc phos 3X, Ferr phos 3X, Kali phos 3X, Mag phos 3X, Nat mur 3X. 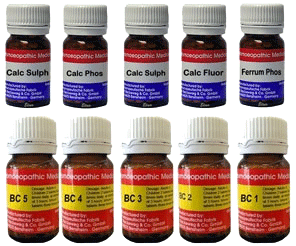 Ingredients: Calc phos 3X, Ferr phos 3X, Kali phos 3X, Nat mur 3X. Schuessler Combination Salt BC-19: Rheumatism, muscular problems: Ingredients: Calc phos 3X, Ferr phos 3X, Kali sulph 3X, Mag phos 3X, Nat sulph. Schuessler Combination Salt BC-20: Skin Diseases: Ingredients: Calc sulph 3X, kali sulph 3X, Nat mur 3X, Nat sulph 6X. Schuessler Combination Salt BC-22: Lymphadenitis, abscess: Ingredients: Calc phos 3X, Ferr phos 3X, Kali phos 3X, Nat mur 3X. Schuessler Combination Salt BC-24: Phosphoric tonic: Ingredients: Calc phos 3X, Ferr phos 3X, Kali phos 3X, Mag phos 3X, Nat phos 3X. Schuessler Combination Salt BC-25: Acidity, flatulence, indigestion: Ingredients: Nat phos 3X, Nat sulph 3X, Nat mur 3X, silicea 3X. Schuessler Combination Salt BC-26 Labour pains: Ingredients: Calc fluor 3X, Calc phos 3X, Kali phos 3X, Mag phos 3X. Schuessler Combination Salt BC-27: sexual neurasthenia: Ingredients: Calc phos 3X, Kali phos 3X, Nat sulph 6X. Schuessler Combination Salt BC-28: Tonic – 12 Salts all in 6X: Ingredients: Calc fluor 6X, Calc Phos 6X, Calc sulph 6X, Ferr phos 6X, Kali phos 6X, Kali mur 6X, Kali sulph 6X, Mag phos 6X, Nat mur 6X, Nat phos 6X, Nat sulph 6X, Silicea 6X. Click on any of the links above to buy the Schuessler Combination Salts from Elixirhealth.co.uk or Neweratissuesalt.co.uk. This entry was posted in Uncategorized on June 25, 2013 by Elixirhealth.